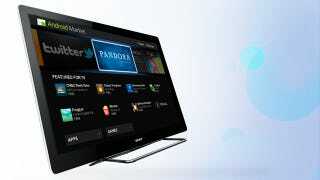 A few weeks ago we asked for ideas on how to make internet-accessible TVs—like the Sony® Internet TV powered by Google TV™—even better, and there were a ton of seriously great entries. But instead of choosing a winner ourselves, we left it up to you guys, our very dear (and very opinionated) readers. Well, the votes have been tallied and the winner is clear. Congratulations, Todd F.! The premise of the app is simple, Recommend other shows and/or movies to watch based on what you already watch. The biggest and the simple elegance of this application is it requires no real involvement other than installation (and some other potential features). The Benefit: The end user gets access to other programs like the one's he's watching. This does not require additional users (but could be supported). A small family that has children will want to see recommendations for children's shows as well as shows for the adults. (However it will/can be set to require a pin for certain ratings to be seen on the display; such as, R, M+, but since it can be configured by the user it can be as low as G Only). WHY IT IS AWESOME: Basically since it requires no real interaction other than watching TV it will build the list for you. Additional features could be added to import the list from Netflix (or other providers) to give real suggestions to your viewing habits to help you find additional shows that are easy to see. Future features: Being able to attach the show to DVR, Go straight to Netflix/Amazon On demand, or the local cable providers On Demand applications. The whole goal of the application is to broaden your horizon based upon your current habits. Much like Netflix has for movies and tv shows based upon your viewing habits. Enjoy your $2,500 Sony gift card, Todd. It couldn't have happened to a better guy that we've never met!